The VAPOR WAKE® detector dog technology created by researchers and canine training experts at the Auburn University College of Veterinary Medicine has received a U.S. patent. VAPOR WAKE® is a scientifically-based method for selecting, training, and employing dogs for the detection of hand-carried and body-worn hazardous materials such as person-borne improvised explosive devices. Detector dogs are trained to follow the scent, or vapor, of odors. “VAPOR WAKE® is an excellent example of the security advancements that can be made when industry and academia work together,” noted Dr. Calvin Johnson, dean of the College of Veterinary Medicine at Auburn University. “Once the need was described, scientists in the College of Veterinary Medicine began conducting experiments to provide proof-of-concept. Afterward, each variable was defined and tested. 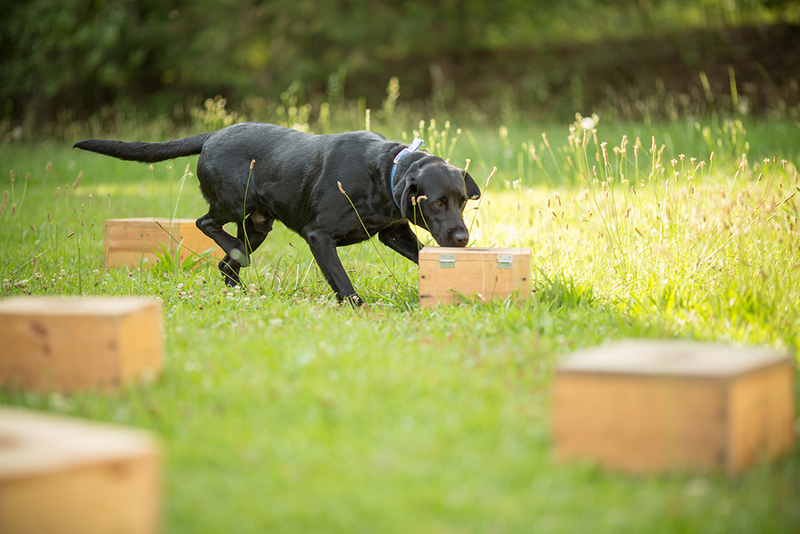 Those variables included canine genetics, puppy selection protocols, canine training methods, handler training, interdiction strategies, establishment of detection standards, and certification/recertification. VAPOR WAKE® was invented by Canine Performance Sciences program members Dr. Paul Waggoner and Jeanne Brock, and former Auburn University employees John Pearce, Tim Baird, Daniel MacAfee and Robert Leonard, now employees of AMK9 Academy, and David Baffa, now with the Transportation Security Administration. VAPOR WAKE® has proven effective in multiple independent field tests and is the only detector dog technology certified by the National Center for Spectator Sports Safety and Security. This method of detector dog use is uniquely suited for screening large numbers of persons at events, high throughput pedestrian traffic areas, and mass transit hubs without impeding their movement. “VAPOR WAKE® evolved like many of the innovations in detector dog technology made by CPS over the last two decades: The operational community came to us with a problem, the interdiction of hand-carried and body-worn explosives in circumstances where obstructing pedestrian movement was not an option,” said Waggoner, recently named co-director of CPS. “We analyzed the operational requirements, looked for information that could guide us in deriving a solution, and then designed a system of dog selection, preparation, and operational procedures to address the problem. We often hear comments like ‘dogs have always done this’ and ‘any good explosive detection dog can be taught to do this’,” said Jeanne Brock, chief canine instructor with CPS who has extensive experience in canine training. “In detecting explosives, for example, the question is not whether it’s been done by some dog sometime in the past or there is some dog and handler team that has on occasion demonstrated the ability to do it, but rather, can you consistently produce a capability to reliably and robustly interdict hand-carried and body-worn explosives. “Vapor Wake®, when faithfully implemented as Auburn has designed, does that,” she added. VAPOR WAKE® detection is an advantageous method and system for detecting explosives and other illicit substances. With VAPOR WAKE® detection, a dog and handler work together as never before – the canine leads the handler. Once the handler positions the dog in a desired location, the dog leads the handler, actually following behind the carrier of the illicit substance. To do this, however, these working canines undergo rigorous training from an early age to teach them how to correctly detect explosive vapors, and then weeks working with handlers on how to work with the animal to develop a perfect team. ARTF has a license agreement for VAPOR WAKE® technology with ITC Security Partners, which in conjunction with the College of Veterinary Medicine, offers the patented VAPOR WAKE® technology to government and industry. CPS, a division of the College of Veterinary Medicine, is an international leader in scientifically understanding the physical, physiological and psychological performance characteristics of working dogs. CPS research discoveries provide human canine handler the ability to take full advantage of a dog’s superb sense of smell. Research by CPS staff to develop a superb detection working dog begins before birth. CPS has identified desired traits in working canines and selectively breeds animals which demonstrate superiority for those traits. From birth, puppies are carefully reared and developed to optimize each stage of their growth. VAPOR WAKE® is one of many successful and ongoing research technologies being developed by Canine Performance Sciences researchers and staff. CPS’s mission is to continually improve animal detection science and technology through research, teaching, and public outreach to serve and defend the nation and society.